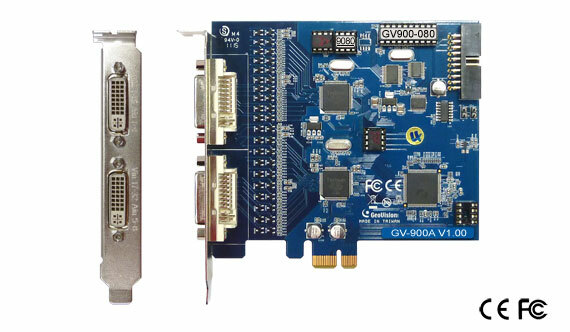 One GV-900A Card provides up to 32 video channels and 8 audio channels, recording up to 240 / 200 fps (NTSC / PAL) in total with H.264 software compression. 1. GV-900A is currently not compatible with VIA series and ATI series chipset motherboards. 2. 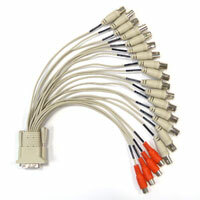 16-port has the same recording rate and display rate as 32-port. Note: The two 1-16 Cams with 4-Port Audio DVI-Type cables are supplied with the GV-900A card with 32 video inputs, the two 1-8 Cams with 4-Port Audio DVI-Type cables are supplied with the GV-900A card with 16 video inputs and the two 1-4 Cams with 4-Port Audio DVI-Type cables are supplied with the GV-900A card with 8 video inputs.